The Chicago Police Star—to many police officers, it is one of their most cherished possessions.When presented to a rookie officer, it is the source of immense pride. When relinquished after a long career, it can be a source of major consternation. These simple pieces of metal can invoke powerful emotions. Although small, the star looms large in symbolism. Although light in weight, it carries a heavy responsibility. Throughout the long history of the Chicago Police Department, the police star or badge- regardless of its shape, size, or material—has represented tradition, integrity, and authority. When the Department was created in 1835, officers did not wear a uniform, but instead carried a white cane called the “staff of office” to signify their authority. 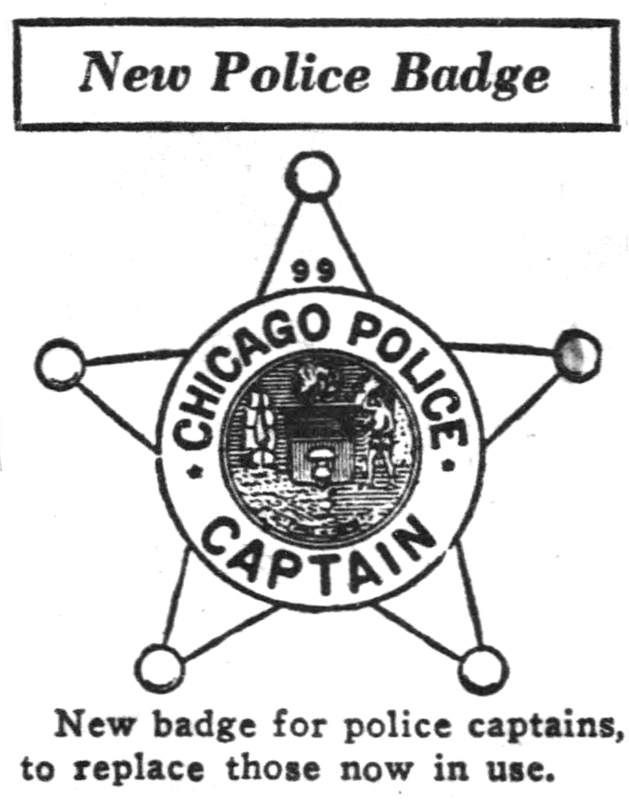 In the next two decades, Chicago Police officers wore a variety of emblems to denote their office, usually on their caps. These included a circular shield with an elaborate laurel worn in the early 1840s, and a simple six-pointed brass star in later years. For a short period, police wore a small, inconspicuous badge on their lapel that could quickly be hidden by officers wishing to remain undercover. In 1857, Long John Wentworth, who was determined to be the police chief as well as the mayor, ordered the officers to wear a leather badge on their hatband. When Jacob Rehm was appointed Police Superintendent under a new mayor the following year, one of his first acts was to get rid of the unpopular leather star. The officers were outfitted in a traditional police uniform with a plain brass star. Unlike many other police forces that employ a shield design, such as the New York Police Department, Chicago police officers have traditionally worn a star as their main police insignia. 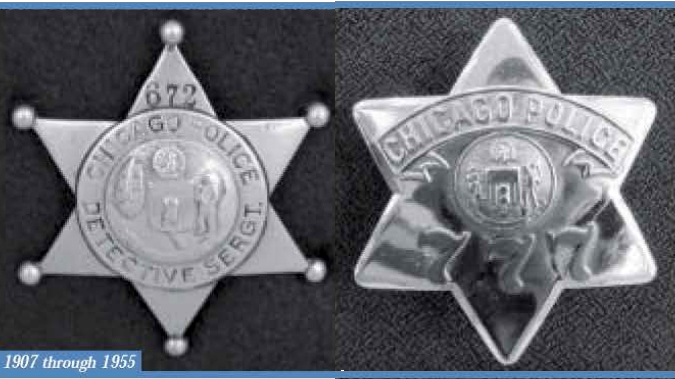 During the 1870s and 1880s, Department officers wore a large, flat, silver, six- pointed star with POLICE stamped across the top, the officer’s number in the center, and CHICAGO across the bottom. In 1889, a fancy silver shield replaced the star worn by Chicago patrolmen, but the experiment lasted only one month. 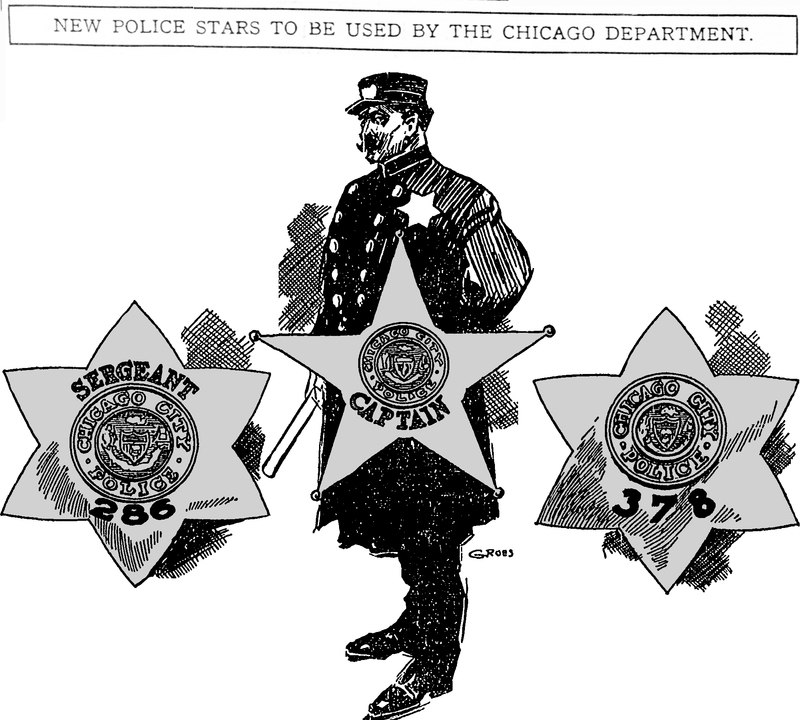 In 1905, Superintendent “Chief” Francis O’Neill introduced a new police star that would adorn the Chicago Police uniform for the next half century. Several reasons prompted the design of the new star. The old star design was too plain and easily counterfeited by criminals. The 19th Century stars were also too similar in style to those worn by the day’s security guards and watchmen, and did not indicate the rank of the officer. Additionally, the paint on the numbers of the old stars could easily be rubbed off with a solvent. The new star’s design featured a detailed rendering of the City Seal in the center, the words CHICAGO POLICE embossed in a raised ribbon at the top, and the officer’s number in large, bronze-colored type on the bottom. It is likely that Chief O ‘Neill, an artistic man, designed the star himself. This large, heavy, silver six-pointed star issued to officers was nicknamed the “pie plate” because of its size. Smaller stars, with the rank indicated and a ball added to each of the six points, distinguished those of higher rank than patrolman. Interestingly, the new stars were introduced only months before the City Council redesigned the City Seal. This meant that while other City departments conducted business and correspondence with the new official City Seal, Chicago officers continued to wear the outdated Seal on their uniform. The silver hat shield, dominated by 4 elements of the modern City Seal, was introduced in 1907. Although the pie plate design remained the most conspicuous Chicago police insignia during the frrst half of the 20th Century, there were various styles, some with just slight differences, for officers of special titles and ranks. Officers with the titles patrol driver, chauffeur, and messenger wore the basic pie plate, but with an added banner in the shape of a pagoda along the top and sides. The superintendents stars during this era, and later for other high ranks, were remarkable in that the gold star’s five points were designed “upside-down.” The star’s lettering and City Seal, of course, were positioned correctly, but the positioning of its points indicated the officer’s high rank from a distance. The star’s single point turned down and the two points pointing upward gave the badge the nickname “devil’s horns.” The balls at the ends of the star points for high ranking officers dates back to the 19th Century. The West Park, Lincoln Park, and South Park Police Department stars were similar to those worn by Chicago Police officers, but each agency had its own distinctive markings. 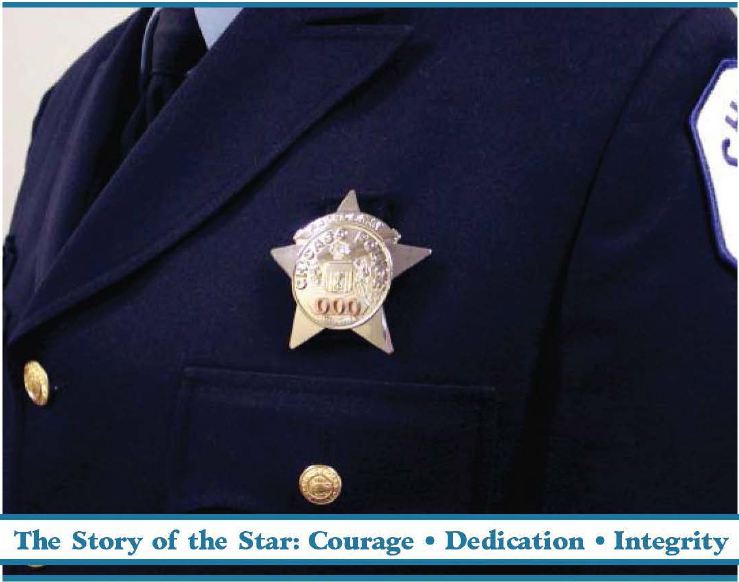 When the three park police forces combined into one Chicago Park Police Department, their officers wore a new silver star featuring blue lettering. In 1955, Police Commissioner Timothy ]. O ‘Connor Chicago introduced the current Chicago Police star design. The new stars were quite a change from the old pie plate design, in that they are considerably smaller, feature a more prominent City Seal, and have five points rather than six. The stars of ranks higher than patrolman remained the same, except that the numbers were placed in front (before 1955, the numbers of some supervisors were on the back of the star). O’Connor explained that the new stars were needed because over the years, “many of the old ones had been lost and some had fallen into the hands of people other than policemen.” The current gold star worn by exempt members, with additional filigree in the design, came into general use after O.WWilson was appointed superintendent in 1960. The Department has introduced a newly designed star for its officers—one for the 21st Century- and with it, the tradition of honor it symbolizes continues. In keeping with polished boots, pressed trousers. brushed coats, and shining buttons, which since the publication of Capt. Alexander Piper’s report, will be new stars for the members of the Chicago police department. Against a background of well brushed blue broadcloth. the old, worn, and battered stars that have done duty for a generation showed, too plainly the effects of hard usage. They offended the artistic sense of Chief O’Neill. Hence the change to the new design, bids for which will be awarded soon. Incidentally the distribution of the new stars will prevent the use of the hundreds of police stars lost, stolen, or retained by those who have left the force. They will also circumvent the patrolmen who have scraped the black enamel from the numbers of their stars and filed the metal down so the number is not legible at a foot’s distance. The citizens’ anti-crime committee advocates going a step farther. It would-have duplicate numbers on the sides of tho patrolman’s cap, out of the way of the coat sleeves that so frequently, Capt. Piper declared, were. to cover lax policemen’s identifying badges. Such numbers would show when the patrolman had covered their stars with rain coats. From Left to Right: 1861-1904 Patrolman Star (1st Issue); 1905-1907 Series Star; 1907-1955 Series with new City Seal. On May 21, 1904, Department Secretary Si Mayer began soliciting bids for the manufacture of a new star in which the members of the department would be supplied. The bid was for nearly 3,000 badges made of German Silver with copper numbers riveted on. The 1905 series badge was initially manufactured by S.D. Childs & Co. beginning in 1905. It is not clear when the transition was made to C.H. Hanson Co., however the badge was made by C.H. Hanson Co. until its decommissioning in 1955. Police Commissioner O’Connor disclosed yesterday he will ask a $20,000 appropriation under the 1955 city budget to provide new stars for members of the police department. Under preliminary plans the stars would be identical for all ranks except that captains and lieutenants would have small balls at the end of each of the five points of their stars. The stars of officials above the rank of captain would be gold plated; others would be nickel or silver plated. The stars would be about the same size as those now worn by lieu- tenants. The present stars have been in use since 1906. One reason for the move is that many police stars have been reported lost—often by a retiring policeman who wants to retain his badge but is forbidden to by department regulations. Some badges, police said, have fallen into the hands of undesirables. Proud history- one that should serve as a tribute to all who have served. Interesting read. My Father Joseph E. Garrity was a Chicago policeman for only 10 years before he was killed in a car accident on 11/17/52.His car went into lake Michigan at Fullerton and Parkway. He left behind a wife Lucille 31, a son Joseph 9, daughter Mary Lou 6, a son Larry 3, and son Steve, who was born 2 months after his death. His son Joe became a Chicago Police Officer and retired after 30 + years of service. Joe Passed away in 2008 at the age of 65. Now, my niece, Kimberly Garrity Otten is a Police Officer for about 12 years. Kim is married to a Police Officer who’s father, Sister, and brother-in-law also Police Officers. My uncle Michael ( Mickey) Garrity is a retired Police Officer. I also have Garrity cousins on the force. Love those Chicago Cops. I have a Chicago PD badge #1480, that appears to be issued btwn 1905-1907. Is there anyone who can tell me the history behind this badge? I have over 40 years in law enforcement in California and Washington State and am interested in this badge. Thank you all and be safe. I bought a City of Chicago official brass star at an auction. It has two bolts on the back. Can anyone tell me what i is? Joe, With the two posts coming out it is a hat badge. The star with bolts in the back were to the best of my knowledge made specifically for the leather jackets. It was a long time ago and I don’t think I ever had one like that but I remember some of the guys having the bolted ones.